I call this my “Ras” “Mas” sorrel because it’s a play on words as opposed to saying “Christmas.” “Ras” is short for “rasta” or someone with dreadlocks (“dreads”). “Rass” can also be the short form of a Jamaican expletive (which I will not type here but you can Google, lol). “Mas” is the equivalent of “Mr.” and is used as a courtesy. So, instead of Mr. Jones, it’s Mas Jones. A more accurate name for sorrel would be “roselle drink” because sorrel is made, in effect, from the sepals of the roselle flower, which is a type of hibiscus plant. The drink, especially if made with rum, is quite strong. But it is festive. This recipe features stevia, which is a 0 calorie sweetener and can be helpful for those watching their sugar intake. The red petals of the sorrel are indicative of the high vitamin A content, which makes this drink nutritious. Ginger in a recipe typically acts as a digestive aid. The spices used add a wonderful accent and make the drink smell (and taste) heavenly. This recipe can easily be adapted for those who would prefer a virgin drink. 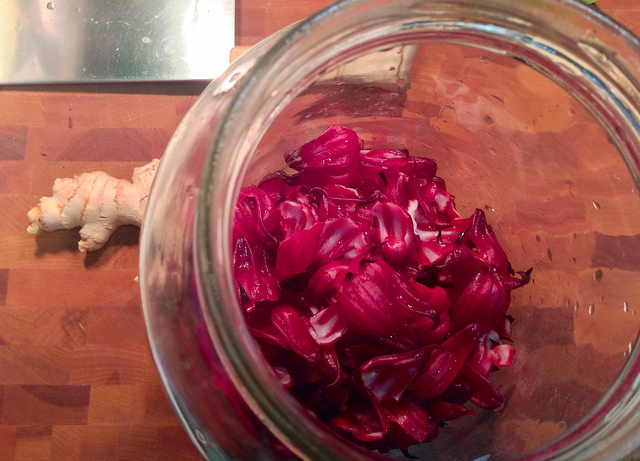 Bring sorrel, ginger, cloves, cinnamon, and pimento berries to a rolling boil for 5 mins. In this recipe in particular, I would recommend you use the whole spice as opposed to the ground version because it makes straining the sorrel easier. You can add more ground spices to the finished product (the strained juice) as you see fit. Cover and let steep for at least 4 hours. Overnight is better and 24 hours is best. Once steeped, strain the sorrel liquid through a mesh strainer or cheesecloth. Sweeten with maple syrup, the strawberry syrup or stevia. Add 1 tsp lime juice and/or a sprinkling of rum if you see fit. Serve with ice. Taken from: https://www.flickr.com/photos/rosiepet/9968705975/. License: https://creativecommons.org/licenses/by-nc-sa/2.0/. No changes made.